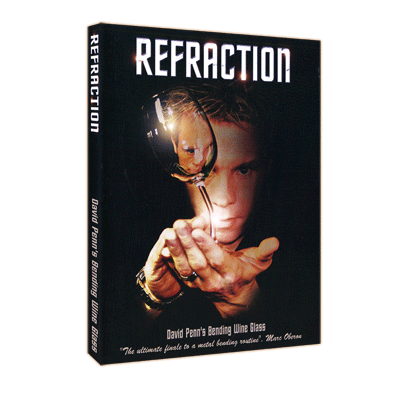 For the first time ever David Penn reveals his signature effect REFRACTION. Whilst holding a borrowed wine glass in both hands your spectator gets to witness the impossible as the stem bends visibly before their eyes. The glass is then given to the spectator to keep as a souvenir that freezes the moment of magic perfectly. David's Cabaret handling presented by Rodney James Piper and a method to bend the spectator's own key which can be used to enhance the REFRACTION effect. Features three live performances and a two camera, studio style explanation filmed at 'The House of Illusion' in Spain. "This is the ultimate finale to a metal bending routine". "I love performing Refraction knowing the spectator will remember that moment for the rest of their lives". "I love the way they look at me in compete awe when I hand them their signed glass". "I have received more repeat bookings due to this effect than any other in my repertoire. The effect is simple in plot, connects with the audience and freezes the moment of magic forever".